We are implementing some organizational changes to DoIT Core Services, effective February 1, 2019. We are creating a new DoIT Department, Application Infrastructure Services, and expanding the scope of the User Services department to include the Productivity & Collaborative Solutions group. These changes better align services and people to improve service and team ownership for outcomes. We will continue to make improvements that position DoIT to help meet campus and internal needs, and to support new strategic initiatives. Background — Why was there a need for change? The services provided by DoIT’s Core Services are the backbone for many University technology operations. It is a responsibility we all take seriously and so do our teams. However, we are not performing at the level required of us to meet the growing technology needs of campus, and we are not consistently competitive with our peers or commercial vendors. An organizational structure is a response to organizational needs and must enable the people in the organization to do great things. As an organization and as individuals, we have an opportunity to reinvent ourselves to be better prepared for the future as technology changes and new campus needs emerge. The changes outlined below reflect a commitment to move to a more collaborative, service-oriented structure. These organizational changes are based on peer institution organizational structures, industry best practices for team structure, and numerous feedback and discussion groups including the CIO listening sessions, the leadership team retreat, the Core Services internal advisory group, Dave Pagenkopf’s leadership loop meetings and suggestion box, the two core services information sessions held in December, and recommendations from Gartner. We also relied on our collective knowledge and experience to build this new structure. The details below reflect the results of the decision-making process outlined above. User Services will increase its portfolio to include the services offered by the Productivity & Collaborative Solutions group. A key goal of this transition is to improve the service we provide for important campus-wide tools, including but not limited to Office 365. Having the entire support line in the same department facilitates service improvement initiatives. Over time, this alignment will enable us to resolve more issues at first contact and improve the experience for individuals on campus using these key IT services. Departmental Support – Provides contract departmental support services to UW–‍Madison departments, ranging from backup support for departmental staff to full-service department security services and on-site department support. Help Desk — Provides troubleshooting and support for a wide range of personal devices, software, and campus services. Additional services include customized support for campus departments, tier-three support augmentation, and service improvements for specific DoIT services. Product Management — Manages the product portfolio in the Tech Store, and provides customized buying support for campus departments. Manages Campus Software Library and WISC software program. InfoLabs — Manages the campus general access computer lab program, as well as the computer checkout and rental programs for campus. Tech Store Sales & Support — Technology consulting and purchasing of academic technology products for departments, faculty, staff and students. Authorized warranty repair for Apple and Dell computers. Productivity & Collaborative Solutions (moving from DoIT Enterprise Internet Services) — Specializes in services and technologies enabling campus individuals and organizations to work together more productively, collaboratively, efficiently, and effectively. In addition to its current staff, staffing in User Services will include individuals from DoIT’s Enterprise Internet Services and Systems Engineering & Operations. 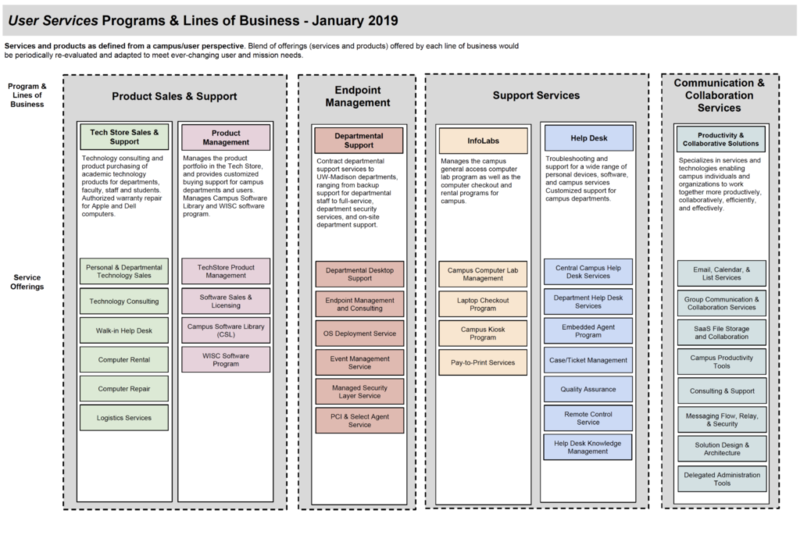 Please see the User Services department lines of business document for more detail on how existing services map to this new structure. 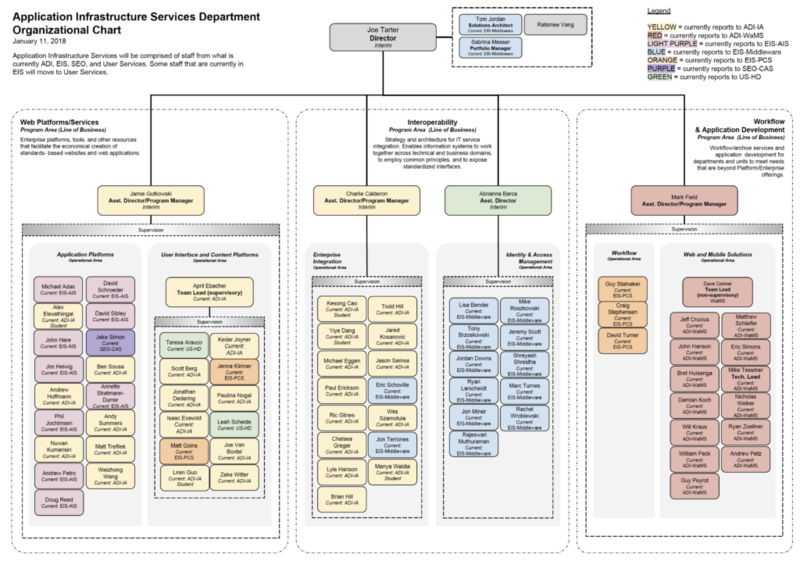 Please see the User Services department organization chart for more detail on reporting lines. Derrian Jones will join User Services and continue to lead the Productivity & Collaborative Solutions (PCS) group within User Services. WiscList will join the PCS portfolio. Josh Olson (SEO) is joining PCS to focus on the integration of WiscList into the PCS portfolio. Cathy Riley will serve as the Service Lead for WiscList. Cathy will report directly to the User Services Director in order to focus on service and project management more broadly within User Services. She joins Jesse Thompson, also reporting directly to the User Services Director, who will broaden his role as Technical Architect for User Services. 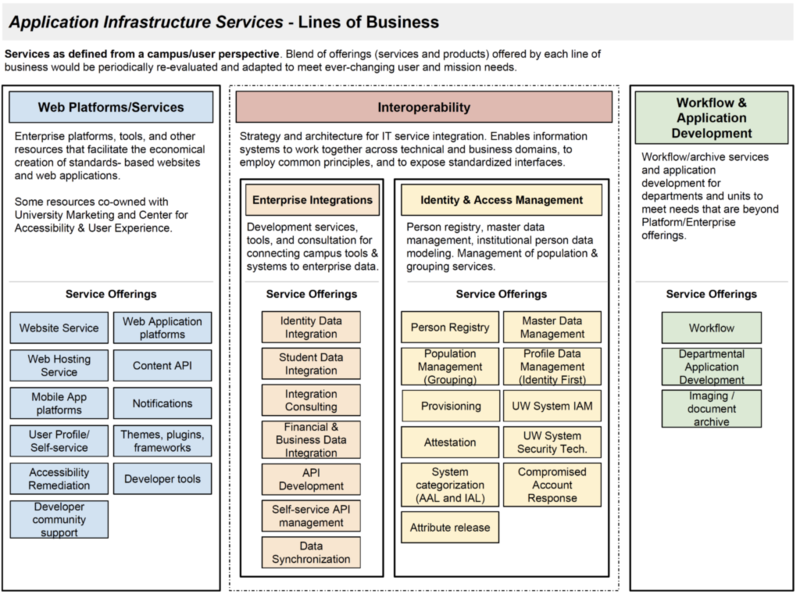 Finally, the UW Madison Knowledgebase which originated at the Help Desk many years ago, will join the portfolio of services in the new Applications Infrastructure Services Department. Leah Scheide and Theresa Arauco will continue their work on the Knowledgebase in this new AIS group. We are consolidating similar and redundant services from Enterprise Internet Services (EIS), Application Development & Integration (ADI), User Services (US), and Systems Engineering & Operations (SEO) into a new department called Application Infrastructure Services (AIS.) A key goal of this new departmental structure is to eliminate redundant services and deliver a more seamless service experience. Through better alignment and improved prioritization, we will be able to re-evaluate vacancies in EIS for strategic needs. Web Platforms/Services — Enterprise platforms, tools, and other resources that facilitate the economical creation of standards-based websites and web applications. Enterprise Integration — Development services, tools, and consultation for connecting campus tools & systems to enterprise data. Identity and Access Management — Person registry, master data management, institutional person data modeling. Management of population & grouping services. Workflow & Application Development — Workflow/archive services and application development for departments and units to meet needs that are beyond Platform/Enterprise offerings. Please see the Application Infrastructure Services department lines of business document for more detail on how existing services map to this new structure. 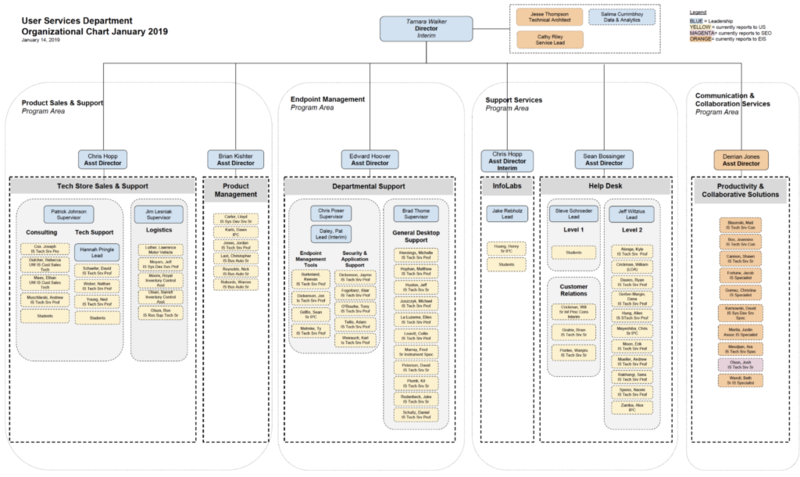 Please see the Application Infrastructure Services department organization chart for more detail on reporting lines. Mark Field will continue as Assistant Director for the Workflow and Application Development group that includes Web and Mobile Solutions (WaMS). Mark will also take on the supervision of the Enterprise Content Management (ECM) service team, formerly part of PCS. Three additional Assistant Directors will be appointed on an interim basis. Abrianna Barca will assume the role of Assistant Director for Identity & Access Management on an interim basis, taking a leave of absence from her current position as the Supervisor of the Level 1 and Level 2 Help Desk Teams. Abrianna is a skilled leader who has demonstrated success in strategy development and implementation as well as a commitment to team development. She will bring her expertise in efficient operations, end-user experiences, and creating campus partnerships to this new team. Charlie Calderon will assume the role of Assistant Director for Enterprise Integration on an interim basis. Charlie brings extensive domain knowledge related to Interoperability, which will be a core focus area for the new Enterprise Integration group. His background and experience with service leadership and operations for services requiring the highest availability will be a key asset in the new department. Jamie Gutkowski will assume the role of Assistant Director for Web Platforms/Services on an interim basis. Jamie brings significant experience in leading strategic initiatives that require coalition-building and broad cooperation. She will provide strong financial management skills, along with efficient capacity planning and brokering of priorities. The new Web Platforms/Service group will bring together development staff from ADI and EIS, along with service delivery staff from EIS, US, and SEO. We are happy to provide these new leadership opportunities to our employees. Please join us in congratulating them on their new interim assignments. We hope that you share our excitement about these changes and the improvements we expect to achieve.